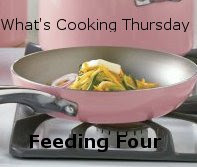 It's been awhile since I shared a recipe and Keli at Feeding Four on $25 a Week is hosting What's Cooking Thursday's and thought I would join in! I wish I had this phenomenal, one-of-a-kind recipe to share but I don't. It is a really tasty one though and easy too. 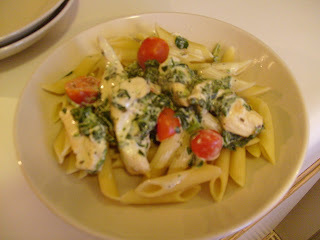 It's Chicken Florentine w/ Penne Pasta. The secret is Kraft's Philly cooking cream, regular flavor. I'm sure I could come up with my own "cooking cream" but the prepared cream really did make it easy. Now I must confess that there was a recipe on the container similar to this but I put my own twist on it. In large skillet saute' the chicken in the heated oil over medium high heat until browned. Drain spinach and press firmly in paper towel to release any excess water. Add spinach, cooking cream, milk, garlic, and seasoning blend to chicken until mixture bubbles. Add tomatoes and cook for an additional minute. Serve over prepared pasta. Sprinkle with cheese if desired. This was sooo delicious. I can see myself making this one again for sure. I've been trying to incorporate more veggies into our diets. Italian food is always an tasty way to sneak those in and have the kids still eat it. I thought this would be a home run and then I look over to see a pile of green on Eian's plate! He was picking out the spinach. Oh well I guess I'll have to step up my game and hide it a little better next time! Make sure to go visit Keli's blog for more great recipes! This is why I enjoy bloghopping on food entries..I get lots of yummy recipes. Thank you for sharing, I am now following your blog via gfc...Happy weekend! Thanks for sharing at What's Cooking Thursdays! You're one of the featured recipes this week!! Oh me oh my, this looks SOO good! !